There's more to explore in the April issue! No matter where you go, you are bound to find someone or something Southern. This spring, I felt like I was finding home everywhere I went. 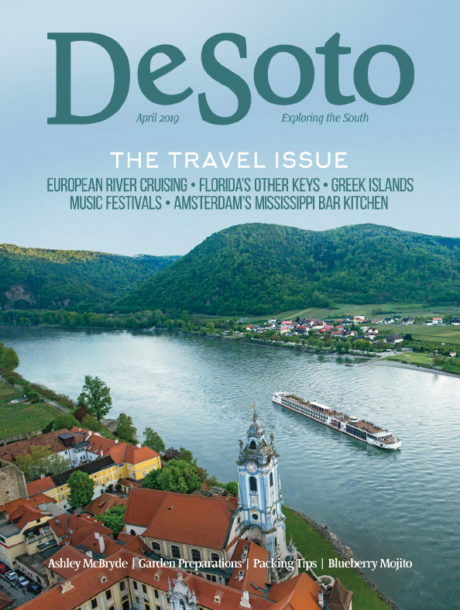 At least, that’s the way it seemed as we put together DeSoto Magazine’s annual travel issue. I met Jennie Curlee, PR director for the Tupelo Convention and Visitors Bureau, and Amanda Murphy of Tennessee Tourism at Travel South USA, an annual event that showcases regional travel. These two dynamic women made me feel right at home in the busy Myrtle Beach, S.C., convention center as we talked about our favorite Southern destinations. Judy and Len Garrison found a big taste of the South in Amsterdam, Netherlands, at the Mississippi Bar Kitchen where they ate for this month’s Table Talk. While in Budapest, Hungary, I was near Elvis Presley Park on the banks of the Danube River and where plans are underway for a statue of The King. Presley voiced his support for the 1956 Hungarian Uprising on the Ed Sullivan Show, and the Hungarians have never forgotten him. Cruising is one of the most popular vacations, and we’ve included two that readers often say are on their bucket lists. Debi Lander explored the Greek Islands while I journeyed along the Danube River. We hope our stories will help you plan your own cruise vacations. If this is your year to stay closer to home, I can’t think of any better places to relax than the towns around the Gulf of Mexico, particularly Florida’s “other” keys: Perdido, Cedar, and Lido. Whether you are an armchair traveler or an explorer looking for new adventures, we think you’ll sail through the pages of this issue with a smile and maybe a touch of wanderlust.